Since this is Labor Day, I thought it would be a good time to look at the roll of labor unions, not from the theoretical perspective which any honest evaluation would reveal that they function to benefit their members, when convenient, to the detriment of the rest of society, but from personal experience that, somehow, shows exactly the same thing. As a young man I went to work in a family owned clothing manufacturing business for my new wife’s grandfather in the village of Richlandtown, PA. We made nice quality ladies blouses, a product our open trade policy has since all but destroyed our domestic production. My job included various record keeping and payroll functions along with some production supervision. Included were my periodic sessions with the union business agent as we would review the employment rolls to be certain of dues payment compliance. The business agent was a union thug, more suited for banging heads than using his. He was an amiable enough thug though and we got along reasonably well… about as well can with someone running a form of the protection racket. The union was the International Ladies Garment Workers Union (ILGWU), at one time, one of the largest unions in the country. The other union in the area was the Amalgamated Clothing and Textile Workers Union. There was not a whole lot of difference between the two, but Amalgamated shops paid their workers ten cents an hour more, and that differential actually cost us some workers. It may not seem like much, like the seven and a half cents from Pajama Game, but in those days, late sixties and early seventies it was almost unheard of for a woman factory worker to make a hundred dollars in a week. After all, two thousand dollars could by you a pretty nice new car, six thousand would buy you a shiny new Cadillac. The union supplied vacation and health benefits, and for some reason, the good ladies thought it came from their $4.50 monthly dues. This was not they case. According to the contract, the union received an amount equal to about ten percent of the payroll to provide the benefits and whatever else unions do with money. Sometime later this was to become a bone of contention and source of strife. At one point, the union said did not believe they got the entire payment they were “entitled” to. My wife’s grandfather was, perhaps, even more stubborn than this writer. Besides, the consortium of manufacturers, the Slate Belt Apparel Contractors should have intervened and set things straight – which did not happen. The end result was that they called a strike and my co-workers and friends were out walking the picket line in front of the building. A day or two later, when the Interstate Dress Carriers truck showed up with a load of fabric to be made into garments, the union driver was turned away as he would not cross their picket line. It did not take long for the issue to be resolved and soon the ladies were back happily sewing up blouses. Unfortunately, they soon ran out of work because of the incident with the truck. The workers were sent home and, of course, applied for unemployment. Since, even at that time, an employers tax, which they euphemistically called a “contribution”, to cover unemployment compensation was based on their “experience rate”, to keep ours from skyrocketing because of the mass layoffs, we filed an objection and requested that the claims be denied. I had the dubious privilege of sitting across the table from my coworkers, with whom I had a good relationship, and explained that the layoffs were the result of union action – that we would have had work had they not turned away the truck carrying our raw materials. I made the case that unemployment compensation should not be approved, even though I knew some of the women really needed the money. I won our case, but the damage was done, and the whole episode was totally unnecessary. Everyone went back to work and things settled back to normal until a few years later things flared up… literally. 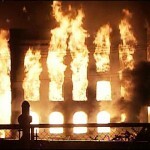 A fire destroyed the factory. It destroyed a mans life work. It also destroyed the jobs of about a hundred and ten good workers. Was it accidental? The inspector said the were three simultaneous points of origination, one at the base of the elevator shaft… no it was not an accident. The old man never would tell us exactly what went on or who was putting pressure on him, or what they wanted. We understood that one of the unions was involved, but, he would never say any more. He may not have wanted his granddaughters husband sitting in jail for torching a union office… I don’t know. Back in those days, I was not so much into standing back and leaving vengeance in the hands of the Lord. It still is not one of my stronger points, especially when someone would harm my family. I have progressed somewhat, but still need frequent reminders, as do most of us. In any case, God apparently had other plans for me than to stick around an industry about to be sacrificed on the altar of internationalism. I have seen first hand the destructive nature of labor unions. They, like the officials they support, do not exist to help the workers, or the country. They exist for union dues and the expansion their own power base. They will use violence and intimidation to accomplish their objectives… kind of like organized crime. We can never forget this. Union Rhetoric Hijacks Labor Day – American workers have accomplished incredible things in our history. There is nothing wrong with taking pride in those accomplishments this Labor Day. But there is something wrong with unions hijacking that pride by taking credit for what they did not do, especially when they claim that they represent all working men and women, when most of what they do and support injures the vast majority of workers, in order to protect their own vested interests. The guarantee of a 5-day work week, a minimum wage, a safe work environment, a 40-hour week, health insurance, pensions are a few of the accomplishments by labor unions that have benefited ALL workers.